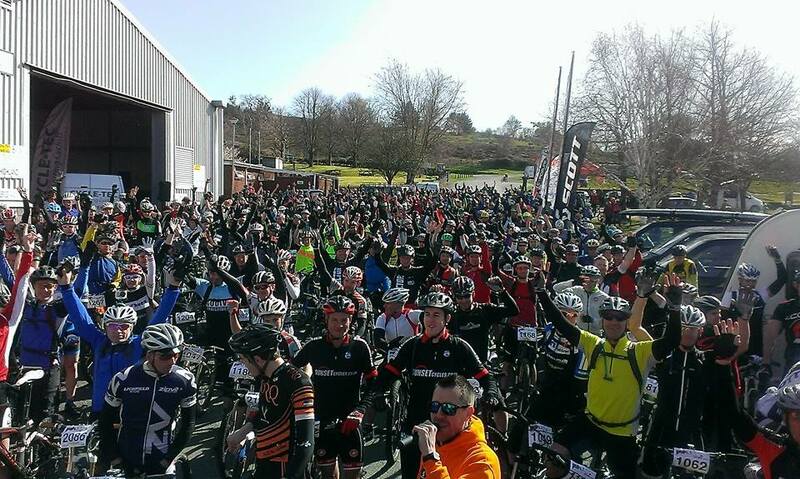 Mountain Bike Marathon in ‘big hills’ shock! 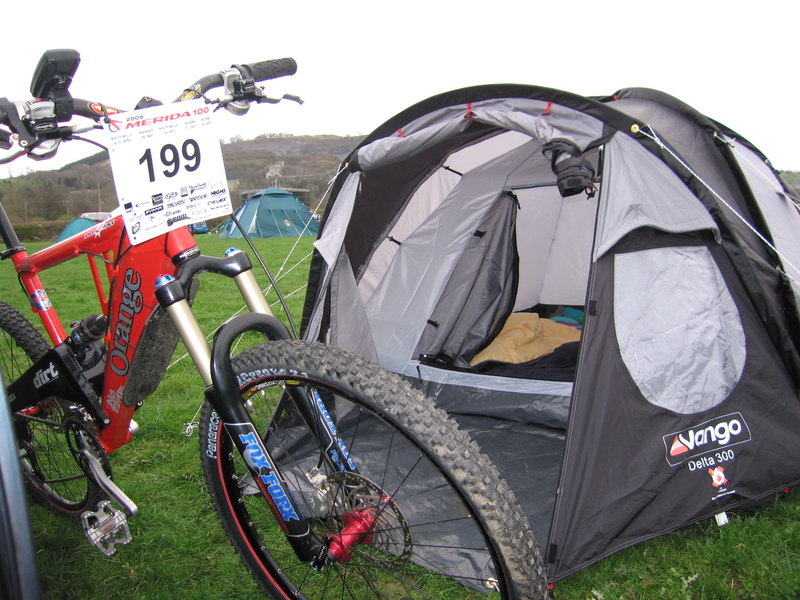 Nine years ago, just as I was starting to get into ‘organised’ cycling events rather than just riding about on my own, I took part in the Builth Wells MTB Marathon. I think it was the first event I did and I bought a new tent and some nice new shorts for it. I think I might have done some training but it was purely an adventure and a chance to ride somewhere new. I took my one-and-only bike, my beloved Orange Patriot. It was a pretty heavyweight, rough-and-tumble type of bike and while I’d built it reasonably light it was no lightweight. It wasn’t the ideal bike for tackling a long day out in some large Welsh hills in hot sunshine anyway. But I got round and I enjoyed it. Fast-forward several years and I returned to Builth Wells for this year’s MTB marathon, actually two marathons as I’d entered the Exposure Lights Big Night Out on the Saturday night (40K of steep hills and narrow sheep tracks in the dark) and then the 75K full marathon that would start on Sunday morning. I arrived in the nick of time after some last-minute bike fixing and a 3 hour drive from Manchester, got signed in, ate a small plate of pasta and got ready for the 8pm start. The bike I’d brought with me was my Niner EMD singlespeed – the one with the Lauf fork that Chipps lent me. It should have been ok but I’d not had time to change the gearing, so I was making do with a reasonably-tall 36:17 ratio. Hopefully the hills won’t be too big or steep…. The hills were really bloody big and some of them were very, very steep. Bugger. I was in trouble. It’s not often that I get off and push up a hill, but I was doing my fair share of it in this ‘ride’. The flatter sections of trail and road were fine- not too spinny and anyone that grovelled past on the steep climbs were soon caught up and overtaken. After the first couple of climbs, things settled down and it was a decent ride. Until my chain tensioner decided to literally fall apart with three miles to go, the jockey wheel ending up somewhere near my right crank arm and subsequently my chain came off. 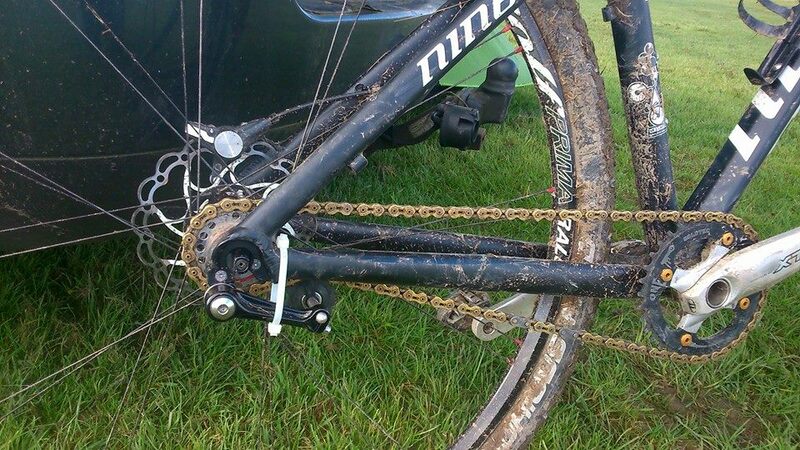 I put the chain back on and watched as it hung limply from the chainring and rear sprocket. Great. I climbed the remaining hills to the finish very slowly and carefully, knowing that putting the chain under too much pressure would probably result in it coming off and sending me, nads-first, into the stem. I returned to the car, got changed into some warm clothes, ate some food and set about ‘redesigning’ my chain tensioner. In the darkness I removed the jockey wheel and chain loop thing and turned them upside down. Due to the fact that the spring in the tensioner had snapped it would no longer be able to push down on the chain. Instead, I had to make it push the chain up with the aid of a large zip tie around the tensioner arm and the frame chainstay. I was pretty sure that it’d work well enough for a 75k ride tomorrow but just be to absolutely certain I rode twenty feet along the campsite road and back…. I thought I’d warm up a tin of soup with my stove. It promptly ran out of gas, so no soup and no Pot Noodle either. I crawled into my tent to get some sleep. I realised that I’d forgotten to bring an extra blanket so I spent the night in my sleeping bag, fully-clothed (including jeans, down jacket and woolly hat) and freezing cold. Skipped porridge for breakfast because I didn’t have a stove so I ate a banana and a piece of cake. The 75k marathon started at 10:30am and I’d decided that if I tried to race around I’d have to properly hurt myself on this bike, so instead I was going to go fast-ish but enjoy the sunshine, dry trails and the day out. I had to push up a few of the climbs but less than I was expecting. I stopped at a couple of the feed stations and had a couple of Custard Creams. I chatted to a couple of mates I saw along the way. I even got a bit sunburnt. I finished in 4 hours-ish (and about 45th ish place) which wasn’t too bad considering the fact that I crawled up anything resembling an uphill gradient towards the end. I was ages and ages behind the guys at the front but I was happy and satisfied that it had been worth the trip. Which is pretty much how I felt the last time I was here with my big red Patriot. Maybe there’s a moral to this story that involves hard cycling events and unsuitable bikes…(all that climbing steep hills on foot is good prep for the 3 Peaks fell race as well). Next time though, I’ll bring a bike with gears.